Arguably the most exciting film discovery of recent times, the films of Sagar Mitchell and James Kenyon were commissioned by travelling exhibitors at the dawn of the twentieth century for screening in town halls, at village fetes or local fairs. Advertised as 'local films for local people', the audience paid to see their neighbours, children, family and themselves on the screen, glimpsed at local football matches, leaving work, marching in civic processions or enjoying the annual works holidays. 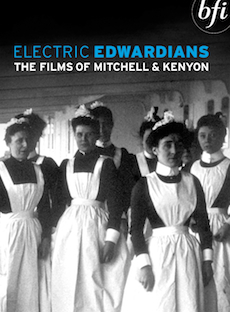 The films of Mitchell and Kenyon take us on a tour of everyday life in Edwardian Britain. They have been identified and researched by Dr Vanessa Toulmin of the National Fairground Archive at the University of Sheffield. The Lost World of Mitchell and Kenyon, the hugely successful BBC TV series, subsequently released on DVD by the BFI, introduced audiences to these miraculous views of the past. Now this new DVD offers the opportunity to explore the collection in greater depth. The material is taken from 28 hours of footage and represents a cross-section of the subjects covered in the collection. From factory gates to football matches, the leaving of Liverpool to the leaving of work, the workers on holiday and at play, it provides an unparalleled opportunity to see the world through the eyes of the working communities of the time. The films are grouped into five sections: Youth and Education, The Anglo-Boer War, Workers, High Days and Holidays, and People and Places; a total of 35 full-length films in all, plus five 'hidden' items. They are set to a specially commissioned score by Sheffield-based duo In The Nursery and presented with extensive extras offering much background material.